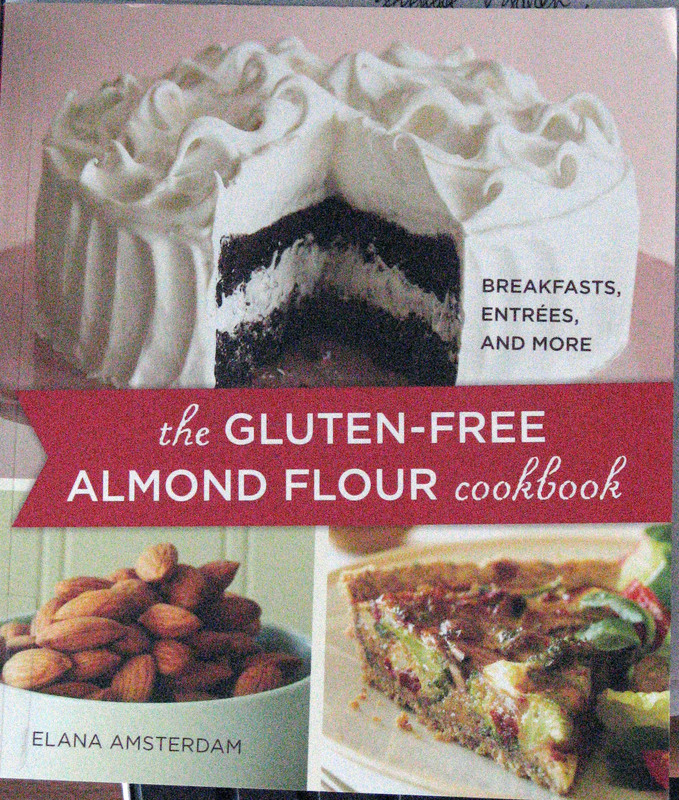 The Gluten-Free Almond Flour Cookbook by Elana Amsterdam is the latest book I've been raving about to my friends. Why am I so excited? Elana begins the book by showing the nutritional benefits of using almond flour (versus white wheat flour or rice flour): there is more than twice the protein in almond flour than the other flours and far more vitamins and minerals. Not to mention: it's also gluten-free! Combined with her exclusive use of agave nectar as a sweetening agent, Elana's recipes produce food that is much lower on the glycemic index than normal cooking which is a boon for people who need to monitor their blood sugar or want to avoid going the route of diabetes. So what does this 126-page book hold? Chapters on breakfast, breads and crackers, entrees, pies, pastries and crusts, cakes and cupcakes, cookies and bars, and toppings, syrups, and sauces. Some of the recipes featured include: Banana Blueberry Muffins, Orange Apricot Scones, Pancakes, Cinnamon Coffee Cake, Scrumptious Sandwich Bread, Olive-Rosemary Bread, Herb Crackers, Chicken Pot Pie, Herbed Turkey Loaf, Eggplant Parmesan, Savory Vegetable Quiche, Pecan Pie, Peach Blueberry Crisp, Strawberry Creme Tart, Pizza Crust, Chocolate Cake, Vanilla Raspberry Torte, Strawberry Shortcake, Chocolate Chip Cookies, Snickerdoodles, Lemon Bars, and Ginger Macadamia Brownies. Another word of advice from a friend: ideally you want fine almond flour, not grainy almond meal (such as my Bob's Red Mill turned out to be). 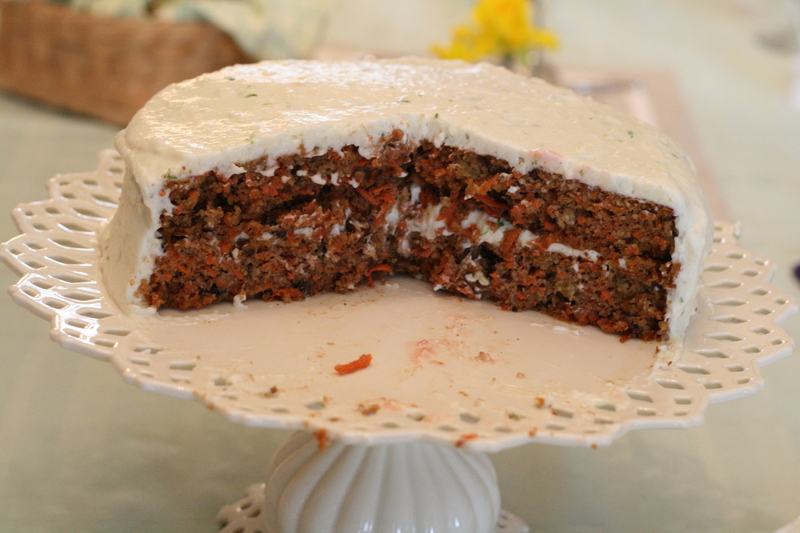 However, despite my grainy textured almond flour the carrot cake still came out quite well. So, if grainy is all you have, try it anyway. Oh, and if you want more inspiration from Elana, check out her food blog here. Preheat the oven to 375F. Grease two 9-inch cake pans with oil, line with parchment paper, and dust with almond flour. In a large bowl, combine the almond flour, salt, baking soda, cinnamon, and nutmeg. In a medium bowl, whisk together the oil, agave nectar, and eggs. Stir the wet ingredients into the almond flour mixture until thoroughly combined. Fold in the carrots, raisins, and walnuts. Scoop the batter into the prepared cake pans. Bake for 30-35 minutes, until a toothpick inserted into the center of the cake comes out clean. Let the cakes cool in the pans for 1 hour, then serve. Note: I topped this cake with a low-sugar, cream-cheese/whipped cream icing (recipe follows). You could use your favorite cream-cheese icing recipe. Elana suggests using her Creamy Coconut Frosting which is also dairy free. Beat the softened cream cheese until smooth. Add the cream, sugar and zest. Continue beating until icing is thickened. Add more sugar if desired. In the 2nd chapter of Elana's book, Stocking the Almond Flour Pantry, she instructs the reader NOT to buy Bob's Red Mill Almond Meal/Flour because it's too coarse and doesn't work in her recipes (p. 8). In her Sources chapter at the back of the book, she recommends Honeyville Farms, Lucy's Kitchen Shop and Nuts Online as sources for blanched almond flour that has the proper consistency for the recipes (p. 127). I have had no trouble at all using Bob's Red Mill Almond flour in all of Elana's recipes. And I appreciate the convenience of being able to buy it at our local health food stores. The icing should thicken up the longer you beat it -- just like when whipping cream.